Each day's prayer challenge has a Scripture, Prayer Focus and Prayer Points. ​Scroll to the bottom of the page for Day 1. VISION. Vision leads us to greater thinking and gives us perseverance to keep going when we might otherwise give up. As we wrap up this marriage prayer challenge, I want to leave you with focused advice from couples who have been married 50+ years. That is no small feat! Heed their advice, get a vision for your marriage and run after it. Here it is in a nutshell. *Expect that there will be crises. It's how you handle those lows that makes the difference. Pray for marriages to get vision for their future together; to think long about marriage and family. Pray for husbands and wives hold fast to one another through every season of life for their lifetime. Pray for marriages to grow deeper in love and commitment through the years. Let the bond of oneness increase between them. SCRIPTURE: Hebrews 13:4, "Marriage should be honored by all..."
A healthy marriage is our focus for this 13th day of the prayer challenge! Every married couple longs for a healthy marriage but you don't naturally fall into a healthy, thriving marriage. It takes work and intentionality to create a marriage that is full of love and life. Here are 10 qualities that are evident in healthy, thriving marriages. Pray through each of these qualities as you examine your heart. Are these evidenced in your marriage? What steps can you take to intentionally grow your marriage into a life-giving relationship? 1) We are better together. Buy into this reality! Put your flag in the ground that we are better together, so you don't run off. 2) Opportunities to push your limits. What you wouldn't do on your own, you will try with the motivation & support of your spouse. A healthy marital relationship gets you to go to places you wouldn't go on your own. 3) Intentionality about spending time together. Steward the marriage relationship, spending time with the most important person in your life. 4) Honor one another. We all come into marriage with ideas of what the relationship will look like. Make room for each other. Respect each other's ideas. 5) Humility. Be willing to lay down or lay aside what you need, putting your spouse's needs before your own. Yield your heart to your spouse. 6) Vulnerability. Be willing to take a risk with your spouse. Have conversations that are challenging. Dream dreams that are bigger to accomplish on your own. Be authentic and real with one another. 7) Prayer. Pray for each other. Pray together for your marriage and family. Make this a habit. 8) Feedback. Invite feedback from your spouse. This increases vulnerability. Ask a question of your spouse: What could I do to make you feel more loved? or more respected? or more cherished? 9) Stories & Testimonies. Share with one another what God is doing and how you see Him moving. What are things you have prayed for together? 10) Shared history. Take time to reflect on where you have been and where you are going. Plan for the future and celebrate the journey of marriage. Pray for marriages to thrive and to reflect the joy of the marriage relationship. Pray for husbands and wives to pray for one another and to pray together! Pray that the Lord would give them a longing to pray together. Declare this over your marriage: WE ARE BETTER TOGETHER! Scripture: Proverbs 11:14 “Where there is no counsel, the people fall; but in the multitude of counselors there is safety"
1) Wisdom~ Your own wisdom is not enough for your life. You only see a part. Proverbs 13:20 says, “He who walks with wise men will be wise.” There’s almost nothing in life that you will figure out on your own. Community provides a group of people who care about you and you can gain wisdom from their experiences. When you need advice or help, ask those in your tribe. 2) Perspective~ We all have blind spots and it is good to hear from others in different seasons of life, occupations & life stories. It helps to give a different or fresh vantage point. 3) Strength~ When you disconnect from others it can cause your heart to lose strength. In community, you give strength to one another to keep going. 4) Safety~ Safety comes when you seek others’ counsel. Many wrong decisions can be prevented by bringing big decisions to your tribe. Ask someone who is ahead of you "What do you think"? Lean into those who have been there. 5) Grace~ In community, grace is a value that grows. From it, you learn to walk with others in vulnerability and intimacy; to be the real authentic you. This value is extended when we need it. Grace is always looking for the best in others and calling forth the gold in each one. Pray for married couples to be connected to others in authentic community; to find their tribe! Pray for husbands and wives to seek out those who are a little further down the marriage road who they can connect with. If you are not in an authentic community, ask the Holy Spirit to connect you to others. Love always protects (bears all things): As a roof covers the house, love shields, protects and guards through every season. Love always trusts (believes all things): Love doesn't know how to quit. It always believes the best, is optimistic about the future and is constant. Love always hopes (hopes all things): Love always expects and anticipates good, looks for the best in others. Love is anchored in eternal hope, not earthly hope and has the expectation of good things. Love always perseveres (endures all things): Love never quits, never surrenders and never gives up! Love stays put, refusing to move under pressure. Love's source is Jesus. Without being connected to the source, love is self-focused, weak and breaks under pressure. Pray for marriages to increase in love for one another. Pray for couples to call out the best in one another. Pray through this verse with your name in the place of the word "love". Ask the Holy Spirit to reveal any areas in which you are not connected to the source of love, Jesus. Is there any area in your marriage where you are selfish, dishonoring, wanting to quit, not protecting, etc? Each one of us have a miraculous starting point of faith where we surrendered the running of our own lives and responded to God's invitation of love. And we each have countless testimonies of God's working in our lives and those in our sphere of influence. What testimonies do you have? Are you careful to not forget what God has done in your life? How do you celebrate the testimonies? Do you share them with your children? How do you teach the testimonies to our children? How can you commemorate and remember all that God has done for you? Greg and I have seen countless miracles in our marriage and family: miracles of healing, deliverance, provision, restoration, salvation, etc. I never want these testimonies to fade from my heart as long as I live. I desire that my children and their children and the children after them to know all that God has done for our family; to share His faithfulness, power and love to our entire generational line, that every generation would know God and love & worship Him! Pray for marriages to have a 100-year vision, to think longer than the present time in which they are living; that couples would be intentional about praying for their generational line. Pray for couples to be alert to God's activity in their lives and their family's life. Pray for husbands and wives to build an altar of praise in their home, to remember all that God has done in their lives. Ask the Holy Spirit for creative ways to ..."teach what you've seen and heard to your children and grandchildren". Good communication is foundational to a strong marriage. There are 4 types of communication. 1) Informal conversations which establish a simple connection in couples without deep emotional intimacy. These kind of conversations are considered small talk: How was your day? How are you feeling today? Etc. 2) Administrative conversations which help a family operate smoothly. These conversations are loaded with action points: talking about daily schedules, to-do lists, appointments, social functions, financial decisions, etc. 3) Challenge conversations which deal with issues. Often these are delicate conversations to resolve conflict. These conversations are talking through disagreements, disappointments and hurts. Avoid "mind-reading"; be specific and use active listening in communicating, "I hear you saying..." or "I feel..." and 4) Life-giving conversations which are proactive conversations about meaningful things. These are the moments of connecting on those things that really matter, sharing hopes and dreams, your inner life with one another. This type of communicating grows couples to be fully known with one another. Pray for marriages to have effective communication skills. Pray through Philippians 2:3-4 for marriages. Pray for marriages to spend time in conversations that are life-giving. Ask the Holy Spirit to search your heart in the area of communication. Is there anything you need to ask forgiveness for from your spouse? SCRIPTURE: Mark 10:6-9, "Jesus replied, 'But at the beginning of creation God made them male and female. For this reason a man will leave his father and mother and be united to his wife, and the two will become one flesh. So they are no longer two, but one flesh. Therefore whatever God has joined together, let no one separate"
The nature of God displays perfect social order and relationships. They are bound up in the Nature of God with the Divine imprint of the Trinity. It's all about relationships. The statement made by God in Genesis 2:18, "It is not good for man to be alone..." was a divine pause in history. It' was as if God was making a statement about His Nature. There had never been aloneness in all eternity until that moment. God intentionally stopped to get our attention. Relationship, oneness, community, fellowship, intimacy, unity~ these are the marks upon humanity because that is who He is as Father, Son and Holy Spirit. We are to reflect Him to the world. Marriage and family were introduced by God. According to God, marriage is an excellent state! At God's choosing, the first activity between God, man and woman is a marriage. Before Adam and Eve become anything else, they become husband and wife! And God delighted in them. It was His will. Marriage should mirror God's image, multiply a godly heritage, manage God's realm, mutually complete one another and model Christ's relationship to the Church. What happened at the fall? Relationships were severed and damaged between God & mankind, mankind & mankind, and mankind & creation. When people live without being connected to the source of Truth, everything gets distorted and twisted. Pray for marriages to thrive; to mirror God's image on the earth. Pray for husbands and wives to leave (all other relationships) and cleave (hold fast to each other). Declare over your marriage: We are no longer two, but one flesh. Nothing and no one will ever separate us. SCRIPTURE: Genesis 1:28, "God blessed them (Adam & Eve) and said to them,'Be fruitful and increase in number..."
God thought up children, family and home. Children are His idea. He instituted the family in the Garden of Eden. He ordered children and commanded them when God said to Adam and Eve, "Be fruitful and multiply". Children are the heritage of the Lord and the fruit of the womb is His reward. In the Bible barrenness was the exception, not the rule, not God's will, not normal, something against His plan and purpose. Every barren woman in the Bible who was godly and believed God's Word became pregnant. Because You are our God and we are Your people and have a covenant with You that You will love us & bless us & multiply us & bless the fruit of our wombs, that neither male nor female among Your people would be barren, we declare quivers full of children!!! Psalm 127:3-5, "Children are a heritage from the Lord, offspring a reward from Him. Like arrows in the hands of a warrior are children born in one's youth". Pray for marriages to be fruitful and multiply! Pray for couples who have experienced infertility to be filled with faith to believe that God is for them, not against them. Pray for friends to stand alongside of them through the hard season of waiting. *I give this resource to the young wives in my life that desire to conceive. I pray through these prayers and promises daily for those in my life that are waiting for the promise of a child to be fulfilled. It is available in paperback and kindle version. SCRIPTURE: Proverbs 17:22, "Laughter is good medicine..."
1) It does the same thing as a work out: lungs breathing, heart pumping, muscles engaged, improving circulation and blood pressure! 2) Laughter relaxes our bodies and stops the brain from producing stress hormones. 3) It activates the immune system, increasing our natural defenses against cancer, viruses, and upper-respiratory problems. 4) It stimulates helpful disease-fighting agents. 5) It diffuses negative thoughts and emotions and produces emotions to give a new perspective on circumstances. Pray for husbands and wives to have fun with one another! Pray for marriage unions to be the most fun relationships on earth: a living witness of the joy of Kingdom marriage. Declare over your marriage: We will smile, laugh and have fun in our marriage! Invite the joy of the Lord to be imparted to marriages. These verses address four areas of marriage: investment, weakness, intimacy and defense. Two are better than one. This speaks to unity and oneness. The picture of marriage is 2 strands of rope, each with their own individuality and limitations but they are better when joined and working together. If they wrap themselves around each other, through their union, they form something stronger than the two individual strands. And scientifically proven, three intertwined strands, no more and no less, is the strongest kind of rope! When God Himself is the 3rd strand, involved in the marriage equation, He fixes the other two strands into place and adds His strength to them. They have a return on the investment in their marriage. They produce more together. Marriage is a good investment! And an exponential investment when connected to the Kingdom of heaven. The response to one another's weakness is to fill in the gap. They help each other up. Often "opposites attract" which is God's divine design, so that in each other's weaknesses, there is strength. Marriage is the most intimate relationship in your life, besides your relationship with Jesus. Genesis 2:25 tells us, "Adam and Eve were both naked, and they felt no shame". This speaks to oneness, being fully known in vulnerability before one another. As two stand under the pressure of attack, they are much stronger. Two can defend because they give strength to each other. They stand together to resist the enemy. What a gift marriage is to you and me! Celebrate these areas in your own marriage today. Where you see a breach, bring that before the Lord in prayer. Pray for husbands and wives to wrap themselves around each other with the bond of love and unity. The two becoming one. Ask the Holy Spirit for increased oneness in your marriage. Invite the Holy Spirit to be the strongest "strand" in your marriage relationship. Pray for marriage unions to be the most intimate relationships on earth: vulnerable, unashamed, fully known & fully loved. Declare over your marriage: Marriage is a good investment! SCRIPTURE: I Peter 2:11-12, "Dear friends, I urge you, as foreigners and aliens, to abstain from sinful desires, which wage war on your soul. Live such good lives among the pagans (world) that though they accuse you of doing wrong, they may see your good deeds and glorify God on the day He visits." We are not residents of this earthly kingdom. We are strangers here, just passing through. We are residents of heaven. We are the people of God and our call is to love what He loves and value what He values. Because of who we are it impacts what we do. God is filled with passion for you! I Peter 2:9-10 says that you are a chosen people, a royal priesthood, a holy nation, God's special possession. Paul urges you to live from a heavenly perspective. See yourself holy! See yourself chosen! See yourself as God's treasure! It will transform your thought-life which will affect your behaviors. Recognize the war for your soul. There is a battle for your heart and affections. Be diligent to guard your heart because your inner world matters greatly. Your choices matter. What do you tolerate? Where do you compromise? Pray for husbands and wives to be diligent to guard their hearts. Proverbs 4:23, "Above all else, guard your heart, for everything you do flows from it". Ask the Holy Spirit to illuminate any areas in your marriage where you have compromised? Ask if there anything in your heart (emotions, thoughts, affections) concerning your marriage that you are tolerating instead of waging war on it? Pray that couples will "catch the little foxes that ruin the vineyards, our vineyards that are in bloom" (Song of Solomon 2:15). The little foxes are anything that is a distraction, interruption, or corruption of the marriage relationship. 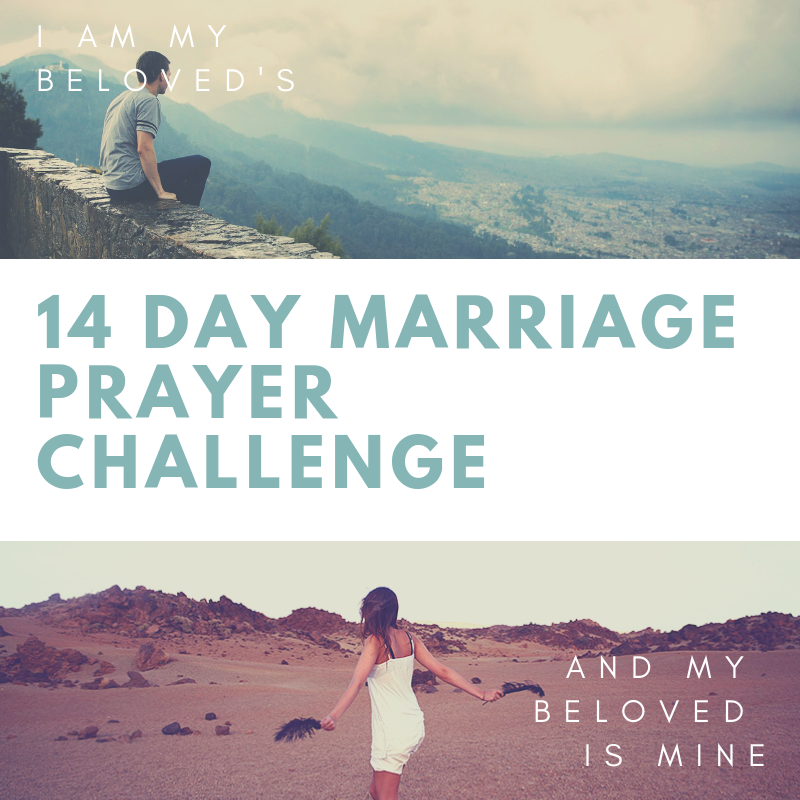 Declare over your marriage: We are holy! We are chosen! We are God's treasure on display to glorify Him! SCRIPTURE: Exodus 33:18, "Show me Your Glory"
God loves to answer this prayer for more of Him. The Lord said to Moses, “I will cause all My goodness to pass in front of you and I will proclaim My Name, the Lord, in your presence. I will have mercy on whom I will have mercy and I will have compassion on whom I will have compassion...there is a place near Me where you may stand on a rock. When My Glory passes by, I will put you in a cleft in the rock and cover you with My hand until I have passed by,” Exodus 33:19. The fulfillment of this is scene in Exodus 34: 5-9. God put His goodness on display. God’s Glory imbues and sustains all of heaven. It is the air of heaven. Perfect love, mercy, grace, kindness, goodness, compassion fills that atmosphere. What would it be for the Glory of God to fill your atmosphere? How would your marriage be affected? Your family? Pray Moses' cry over your marriage, "Show us Your Glory God!!!!" Pray for God's perfect love, mercy, grace, kindness, goodness and compassion to be experienced in the hearts of married couples. Invite God to put His goodness on display in your marriage and family. SCRIPTURE: Ephesians 3:17, "And I pray that you, being rooted and grounded in love..."
In nature, whatever is the root of the tree will be seen in the tree's nature- in every leaf, branch and fruit. Marriages rooted in love will be unshakable and unmovable. The foundation (root system) must always be bigger than the structure it is supporting. Whatever goes in at the beginning matters greatly because it affects the outcome. If the foundation is weak, the marriage will be weak. If the foundation is strong, the marriage will be strong. Every marriage is rooted in something. What is your marriage rooted in? Let your roots go deep into the love of God. A deep root system will help a tree produce fruit that lasts. Pray for couples to receive more revelation of the love of God in their lives, God's love that is high, wide, long and deep (Ephesians 3:18). Pray Psalm 1:3 over your marriage, "Our marriage is like a tree planted by streams of living water, which yields fruit in season and whose leaves do not wither--whatever we do prospers"
Pray for newly married couples to be rooted in God's love. SCRIPTURE: Matthew 13:31-32, "The Kingdom of Heaven is like a mustard seed, which a man took and planted in his field. Though it is the smallest of all seeds, yet when it grows, it is the largest of garden plants and becomes a tree, so that the birds come and perch in its branches." Marriage begins as a seed of promise which grows over time, with watering and nurturing into the largest of garden plants to provide refreshment to others. The influence of a Kingdom marriage affects those in your sphere and beyond.